Yule Brynner's Gunslinger is one of many robots designed for entertainment in Westworld, a futuristic theme park. But when the robots run wild the gunslinger turns into a mechanical killer. Benjamin is forced to fight for his life. It becomes a battle between man and robot, with the strength apparently on the robot's side as he has been fitted with acute hearing and infra-red vision. Nevertheless man wins against robot in the end. Michael Crichton wrote Twister and Jurassic Park but here he directs this sci-fi classic in which the slave technology produced by man threatens to overcome its master. The film relies on dramatic tension with few special effects (the acid-scarred and torched gunslinger is character rather than special effects) as we see the robots gradually asserting their independence. We note contrasts between the super-efficient white-coated but ultimately helpless scientists and their electronic creations as well as the contrast between the metallic technical computerized world and the dusty primitive mid west. We also see the pleasure seeking and ineffectual guests (the red knight who would rather kiss the serving wench than fight, the inept man in glasses who plays at being Marshall). 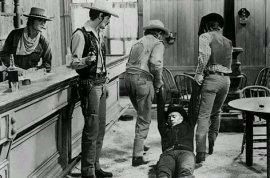 Rowdy entertaining play-fights in the saloon turn to serious shoot-outs in the street as the gunslinger shoots real bullets. In each case the man-made environment is not enough to protect people from real life when the robots start to take over. The tension is built up for the first half of the film by emphasizing the fun and recreation of the new "worlds" which are "the best amusement park in the world" - showing the robots as humanoid servants.
" supposedly you really can't tell ­ except by looking at the hand." Reassurance is given at every stage " nothing can go wrong", "there's no way to get hurt here ­ just enjoy yourself ". Naturally we come to suspect that something will go wrong. Humour is generated by the almost play-fight saloon brawls to accompanying lively fiddle music, with balsa ­wood chairs and brittle bottles being smashed everywhere without serious injury. Comic routines include ducking well before a chair is thrown then bobbing up again, slow-motion action for men falling down stairs, onto tables and through banisters. This is mock fighting. Real fighting is to come in the second half of the film. An inept guest is also used as a comic figure. He wears glasses and a vest, narrows his eyes as he imagines his own bravery, has a rather strangulated voice, shoots a mirror while practising drawing his gun and nearly locks himself out of his office when he assumes the role of Marshall. The humour, however, disappears in the second half of the film when things become serious. Where at first Pete is shocked to realise he's actually killed someone, he begins to accept that the gunslinger is "only" a robot so shoots him with considerable violence the second time. This is emphasised by the number of shots fired, the kicking in of the door, the fall through the window to the ground ­ all in slow motion for maximum impact. As the gunslinger asserts his independence and is out of control of the scientists he seems to be seeking vengeance, killing John on their third meeting and starting the long chase sequence in the second half of the film. Possibly John deserves his fate as, after making love to the saloon girl robot he says "machines are the servants of man." We begin to realize that the servants or slaves are more complex than we'd first assumed. First the snake bites John: "that's not supposed to happen!" Then in a meeting of the top scientists they discuss how to react to the continued malfunctions. Opting not to close the park, they set themselves up to be destroyed by their own creations. Commerce dictates that they must not close down. The gunslinger has now been enhanced for brain power and audio and so becomes a more powerful adversary. The scientists admit they don't know exactly how all the robots work- they are "almost as complicated as living organisms" and some parts have actually been designed and built by other robots. Now the servant refuses the guest's seduction and we find she is "not responding correctly." While one scientist casually eats a sandwich, appearing relaxed but in charge we cut to the black knight (a robot) fighting the red knight (a guest) and the black knight kills the guest with a savage thrust to the stomach. Now everything is out of hand. Power is cut but has no effect on the robots ­ only on the scientists, who are trapped in their rooms without oxygen. They have sealed their own fate. When the gunslinger kills John, Pete is left on his own and the final chase is a contest between powerful robot and ingenious man. The robot's hearing is so acute he can track Pete by listening to him as they ride through the hills beyond West World. A chance meeting with a technician suggests the only way to defeat the robot is by acid to the visual senses. Returning to WestWorld through the corpses of guests at Roman World and to the background track of rhythmic jangling chase music, Pete makes his way down endless corridors to the workshop / hospital. Lying in wait he flings acid at the gunslinger who seems to stumble as the acid burns his face and he is wreathed in smoke. Is he destroyed? Pete escapes but is still pursued by the gunslinger who, in a first suggestion of weakness, fires his gun - but finds it has run out of power. Following Pete with a constant stalking pace and clicking heels the gunslinger finds himself in Mediaeval World and seems disorientated. He seems unable to adapt to a new environment ­ a key feature of human learning. A combination of damage to his face and the distraction of blazing torches on his heat-sensitive eyes gives him a puzzled look, earns our sympathy, and gives Pete a chance. Pulling down the torch he flings it at the gunslinger who is enveloped in flame ­ an effect which is emphasized by using 14 separate camera shots, none longer than 4 seconds producing a 45 second scene of the gunslinger burning up while Pete looks on in horror. We are shocked and saddened by the robot's violent end. At last Pete feels safe and the tension which has built up from the moment of the snake bite drops. A girl in a dungeon catches his attention - "help me" she cries weakly - but as he sympathetically tries to give her water, sparks fly and he realizes she too was a robot. Finally a burned gloved hand appears from the left of the screen giving us a warning moments before Pete realizes that the gunslinger has returned, horribly burned. He falls and we see an empty face replaced by the circuitry behind. At last the robot has returned to his natural state and is no longer a humanoid threat. The ironic phrase "Boy, have we got a vacation for you" echoes around the castle and jolly country music is played - in ironic contrast to the exhausted Pete. Pete has shown that, despite all assurances, first that everything will be safe and second that he hasn't got a chance, human resourcefulness can outwit technology; but the message is a warning against playing God by creating robots.